The map “Functional types of settlements” is created using conventional symbols. It shows the distribution of settlements within the Baikal basin and their economic significance. The main content of the map is the network of urban and rural settlements with their population. The size of population is shown by the symbols of different sizes in accordance with the selected scale of nine gradations of the population size. The color of symbols shows the functional type of settlements determined based on the structure of employment of the local population in various sectors of economy. 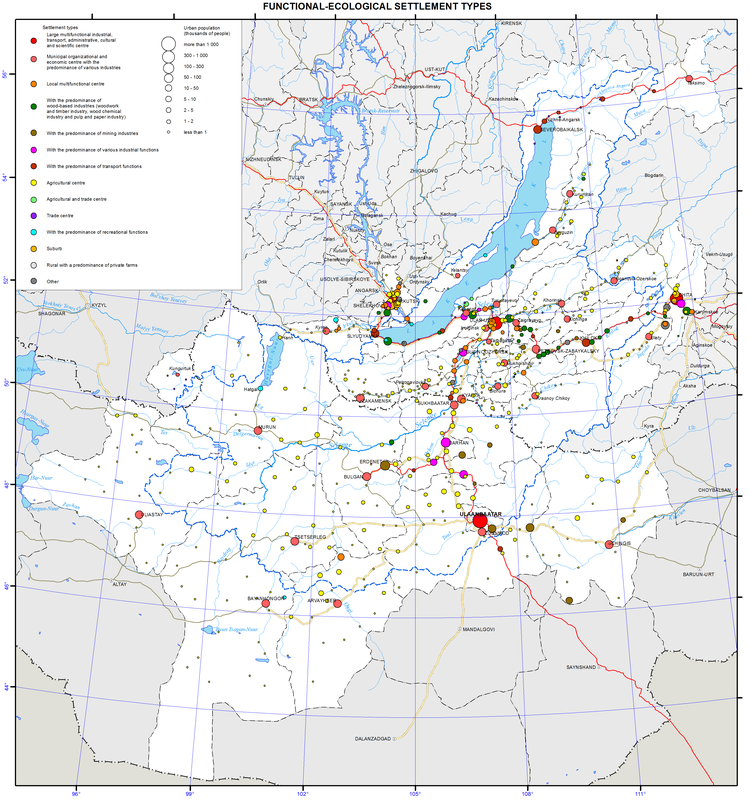 A dominant role in the settlement network formed in the Baikal basin is played by large multi-functional industrial-transport, administrative-cultural, and scientific centers of the state (Ulaanbaatar) and regional (Irkutsk, Ulan-Ude, and Chita) significance. Various specialized industrial and transport centers are almost exclusively confined to the railway lines. Local organizational-economic centers performing the nodal functions of serving their hinterlands are scattered over a greater part of the territory. The dispersed pattern of settlement is especially clear in the Mongolian part of the Baikal basin, where each aimag is dominated by a corresponding administrative center with a sparse network of agricultural settlements. Quantitatively, the region’s territory is dominated by small rural settlements with agricultural functions; their predominance is especially high in Mongolia. They are scattered within the steppe areas and in the southern part of Buryatia, where they are confined to river valleys. Settlements with the predominance of recreational functions are few in number and are mainly confined to the shore of Lake Baikal (Listvyanka, Utulik, Khuzhir), to the shore of Khovsgol (Khatgal), and to the Tunkinskaya Valley (Arshan). Large-scale inset maps “Irkutsk”, “Ulan-Ude”, and “Chita” demonstrate functional types of settlement in the areas of direct influence of the respective regional centers, around which the specifics of the suburban type of settlement is clearly manifested. — Territorial contrasts in the settlement patterns, social and demographic structures, employment, and living standards of the population between different localities, which is especially pronounced when comparing the Mongolian and Russian parts of the lake’s basin. Federal State Statistics Service. (2012). Population of the Russian Federation in municipalities as of January 1, 2012. Moscow: Rosstat. p 527. Federal State Statistics Service. (2013). Population of the Russian Federation in municipalities as of January 1, 2013. Moscow: Rosstat. p 525. All-Russia Population Census of 1989. (1991). Population and settlement patterns, groupings of districts and rural councils by population, groupings of urban and rural settlements by types and population. Vol. 1. Moscow. National Statistical Office of Mongolia. (2011). Mongolian Statistical Yearbook 2010. Ulaanbaatar. p 463.